St Stephen's Day, or the Feast of St Stephen, is a Christian saint's day celebrated on 26 December in the Western Church and 27 December in the Eastern Church. Churches which adhere to the Julian calendar mark St Stephen's Day in January, although from their perspective they are celebrating it in December. It commemorates St Stephen, the first Christian martyr or protomartyr. The day is a public holiday in Austria, Germany, Ireland, Italy, Denmark, Finland, Catalonia, Croatia, Republika Srpska, and Romania. 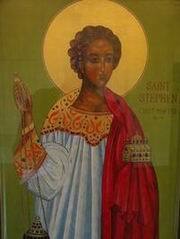 St. Stephen's Day is also the "feast of Stephen" referred to in the Christmas carol Good King Wenceslas. In Britain, Australia, New Zealand and Canada, Boxing Day is celebrated instead, which in most years falls on the same day (Boxing Day falls on the first non-Sunday after Christmas, either 26 or 27 December).